TS Voter Slips can be downloaded from the official website www.tsec.gov.in. TS Assembly Elections will be conducted on the 7th December 2018. Voters can Download TS Voter Slip 2018 by entering the required information into the official website few days before the schedule begin of the assembly polls. Voters from all Adilabad, Hyderabad, Karimnagar, Khammam, Nizamabad, Nalgonda, Medak, Mahabubnagar, Rangareddy and Warangal districts can download Booth Slips from CEO, Telangana website also www.ceotelangana.nic.in. Telangana Assembly Elections will be conducted for the 119 assembly constitutions across Telangana. Registered voters need to download the TS Voter Slip from the State Election Commission website. Voter Slip contain all the required information such as Name of the voter, name of the father, polling booth details with map and BLO (Booth Level Officer) name and mobile number. Voters can easily find their booth by downloading TS Voter Slip or TS Booth Slip from the official website. 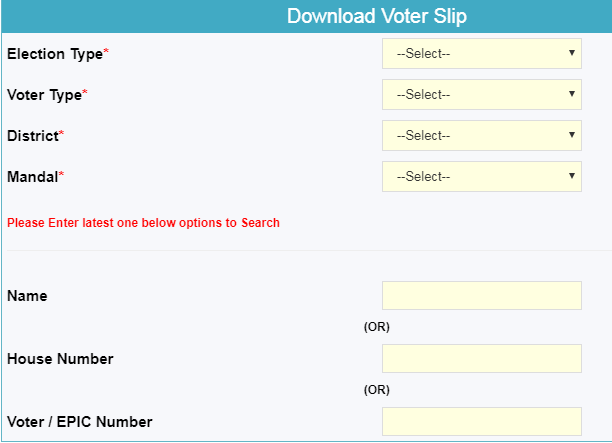 How to download TS Voter Slip 2018? Voters need to visit the official state election commission website for downloading Voter Slips. They need to furnish the following information for downloading these as shown in the following image. In general several political parties will distribute TS Voter Slips to the voters before elections day. Voters can also download Telangana Voter Slip from the official website. Recently all political parties have released their party manifesto for Telangana Assembly Elections 2018.